Recent industry articles provide context for the mission of the SDVoE Alliance. In this CEDIA Tech Talk, Jason Knott, editor of CE Pro, asks the panel tough questions about “How to Design the Best AV Over IP Ecosystem”. 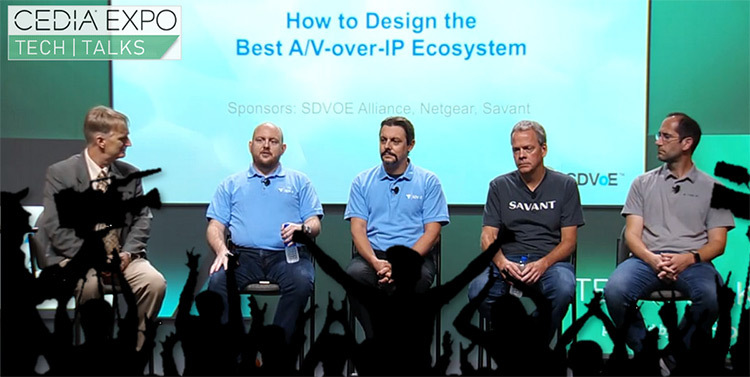 Representatives Justin Kennington of the SDVoE Alliance, Laurent Masia of NETGEAR, Tim Locascio of Savant and Matt Lavin of Metro 18 share their insights. Julie Jacobson, producer at CE Pro, gives an overview of the session. Networked AV Systems: It’s time to clean house. SDVoE Alliance president Justin Kennington walks you through our codec shoot out at InfoComm 2017, where you see four monitors showing the same 4K PC desktop run through a splitter and then through four different codecs: SDVoE (based on AptoVision BlueRiver technology), MJPEG 2000, VC-2 and H.264. Quality and latency are compared. Will InfoComm 2017 Hasten Rise of AV-over-IP, Death of the Matrix Switch?